The Australian Capital Territory (ACT) is the capital territory of the Commonwealth of Australia. The Australian Capital Territory is a small territory within the state of New South Wales. 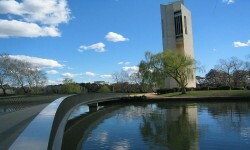 Canberra is the capital of the ACT. Canberra being the capital city of Australia. The ACT is bounded by the Goulburn-Cooma railway line in the east, the Naas Creek in the south, the Cotter River in the west, and the Molonglo River in the north-east. The Australian Capital Territory also contains agricultural land - sheep, dairy cattle, vineyards, small crops. Canberra is notorious for hot, dry summers and cold winters with equent frosts. Sites of interest in the Australian Capital Territory include: Williamsdale, Naas, Uriarra, Tharwa, Namadgi National Park, Hall, Tidbinbilla Nature Reserve, Canberra Deep Space Communications Complex, Royal Military College - Duntroon, Australian Defence Force Academy, University of Canberra, Australian National University.